The timing of flowering is important for fitness and reproductive success in plants. Numerous studies demonstrate that variation in flowering time correlates with yield in model and crop plants under field and control conditions. How flowering time affects yield remains an interesting question. It is commonly argued that because flowers are sensitive to abiotic stresses, plants have to set flowers when environmental conditions are optimal for flower fertility and seed set. Flowering time genes thus indirectly affect flower fertility and yield as they determine when plants flower. In addition, the timing of floral transition decides when plants switch from producing leaves to producing flowers. Variation in the duration of vegetative and reproductive growth ultimately affects plant and spike architecture. Monocot cereals represent good models to study the effects of flowering time regulators on spike architecture. In contrast to the model plant Arabidopsis, where floral transition and flowering take place within a short period of time, in cereal crops such as wheat and barley several weeks may pass between the initiation of the first flower primordia and flowering. This provides an opportunity to dissect the genetic and environmental control of spike development. Variation in spike development affects the number of seeds per spike as one of the major yield components in monocots cereals. Consequently, the manipulation of seed number per spike and spike architecture is important for breeding high-yielding cultivars. 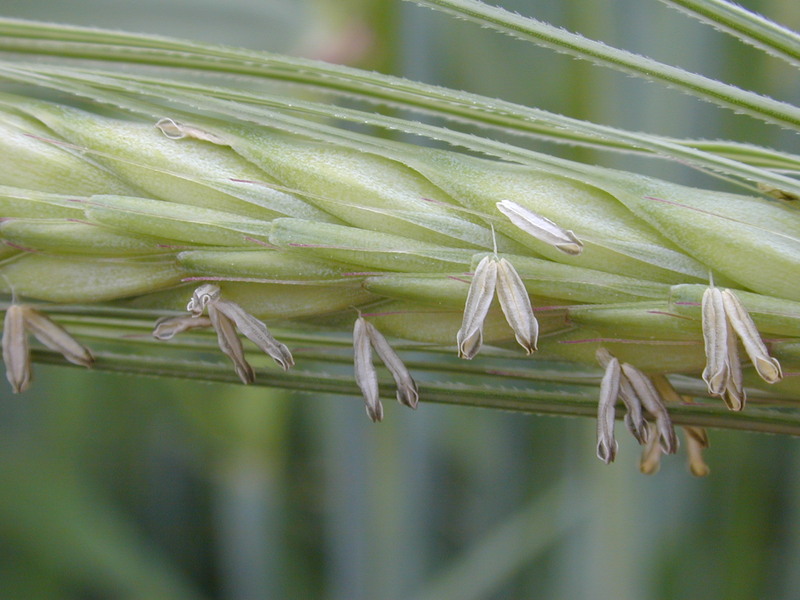 The flowers of cereals develop on a specialized short branch called a spikelet which carries one or more florets and forms on opposite sides of the central rachis. Genetic factors affecting the number of fertile spikelets per node have been identified in maize, rice and barley. For example, the barley specific Vrs1 locus encoding a homeodomain-leucine zipper (HDZip) I transcription factor suppresses the development of lateral spikelets and thus determines formation of two or six spikelets and seeds per rachis node (Komatsuda et al., 2007). In addition, genes controlling initiation and outgrowth of lateral branches or axillary meristems such as RAMOSA (RA2) or TEOSINTE BRANCHED 1 (TB1) affect spikelet number in barley and maize (Bortiri et al. 2006, Ramsay et al. 2011, Koppolu et al. 2013). Interestingly, a recent study in wheat reveals that the flowering time gene Photoperiod-1 (Ppd-1), a pseudo-response regulator gene that is known to control photoperiod-dependent flowering, has a major inhibitory effect on paired spikelet formation (Boden et al. 2015). Paired spikelets are characterized by the formation of a second spikelet immediately adjacent to and directly below a typical single spikelet in wheat. In temperate cereals, allelic variation in Ppd-1 influences sensitivity to long-day (LD) photoperiods; a mutation in this gene confers a delayed flowering response under LD conditions in barley, while in wheat gain-of-function insensitive alleles promote a constitutive LD response in all photoperiods (Turner et al. 2005, Beales et al. 2007). Boden et al. (2015) analysed near isogenic wheat lines (NIL) which either carried photoperiod insensitive alleles of PPD1 (flower early regardless of photoperiod) or photoperiod sensitive alleles of PPD1 (flower earlier in LD than SD photoperiods). They demonstrate that the photoperiod sensitive NIL flowered very late and produced paired spikelets under SD conditions. The authors further demonstrate that variation in the formation of paired spikelets correlates with the expression of TaFT, the wheat homolog of FLOWERING LOCUS T (FT) in Arabidopsis. In Arabidopsis, FT protein is produced in the leaf and transported to the shoot apical meristem where it triggers expression of meristem identity genes that regulate the development of the inflorescence and floral organs. 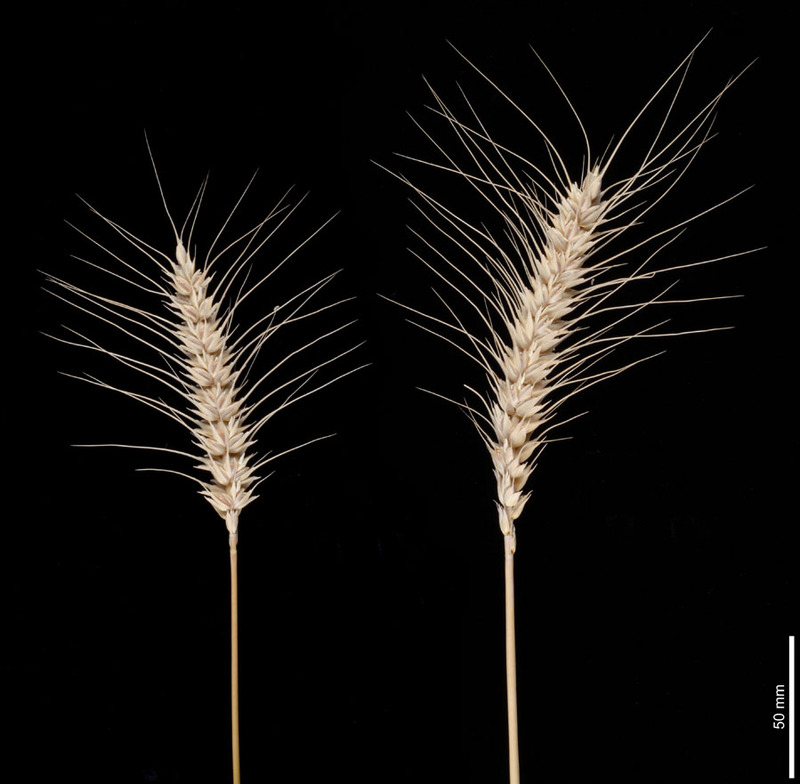 In wheat, low expression of TaFT and downstream meristem identity genes such as TaSOC1 (SUPPRESSOR OF OVEREXPRESSION OF CONSTANS 1) and TaVRN1 (VERNALIZATION1, APETALA1/FRUITFUL-like) increased the formation of paired spikelets. These results suggest that the strength of a floral signal determines when inflorescence axillary meristems are converted to spikelet meristems, so that either a short branch comprising a lateral (secondary) and terminal (primary) spikelet forms or a single spikelet. These findings show that modifying the expression of flowering genes can be used to modify the number of grain producing spikelets. Future studies may investigate whether and how flowering time genes control the expression of “classical” branching genes such as VRS1, RA2 or TB1. Boden SA, Cavanagh C, Cullis BR, Ramm K, Greenwood J, Finnegan EJ,Trevaskis B, Swain SM. 2015. Ppd-1 is a key regulator of inflorescence architecture and paired spikelet development in wheat. Nature Plants 1, 14016. Bortiri E, Chuck G, Vollbrecht E, Rocheford T, Martienssen R, and Hake S. 2006. ramosa2 encodes a LATERAL ORGAN BOUNDARY domain protein that determines the fate of stem cells in branch meristems of maize. Plant Cell. 18, 574–585. Beales J, Turner A, Griffiths S, Snape JW, Laurie DA. 2007. A Pseudo-Response Regulator is misexpressed in the photoperiod insensitive Ppd-D1a mutant of wheat (Triticum aestivum L.). Theoretical and Applied Genetics. 115, 721–733. Komatsuda T. et al. 2007. Six-rowed barley originated from a mutation in a homeodomain-leucine zipper I-class homeobox gene. Proceedings of the National Academy of Science USA 104: 1424–1429. Koppolu R, Anwar N, Sakuma S, Tagiri A, Lundqvist U, Pourkheirandish M, Rutten T, Seiler C, Himmelbach A, Ariyadasa R, Youssef HM, Stein N, Sreenivasulu N, Komatsuda T, Schnurbusch T. 2013. Six-rowed spike4 (Vrs4) controls spikelet determinacy and row-type in barley. Proceedings of the National Academy of Science USA. 110,13198-13203. Ramsay L. et al.. 2011. INTERMEDIUM-C, a modifier of lateral spikelet fertility in barley, is an ortholog of the maize domestication gene TEOSINTE BRANCHED 1. Nature Genetics. 43, 169–172. Turner A, Beales J, Faure S, Dunford RP, Laurie DA. 2005. The pseudo-response regulator Ppd-H1 provides adaptation to photoperiod in barley. Science. 11, 1031-1034. This entry was posted in flowering, flowering time, genetic resources, Plant breeding, Uncategorized and tagged allelic variation, barley, cereals, Flowering, Flowering Locus T, Maria von Korff, photoperiod, spikelet, wheat. Bookmark the permalink.